Two US scientists and their UK collaborator have been awarded the Nobel Prize for medicine for their groundbreaking work in gene technology. 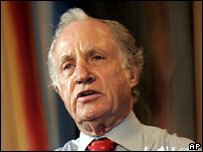 Mario Capecchi, Oliver Smithies and Briton Martin Evans developed a technique known as gene targeting. It enabled them to replicate human diseases in mice by introducing genetic changes into the animal's stem cells. The Nobel Committee said this had led to many new insights into conditions such as cancer and heart disease. For instance, science has gained a greater understanding of how disease can strike otherwise healthy people. The technique has also helped to shed new light on the ageing process, and on how the embryo develops in the womb. It can be used to study almost every aspect of mammalian physiology. In its citation, the Nobel Committee praised the technique as "an immensely powerful technology" which was now being used in virtually all areas of biomedical research. "Gene targeting in mice has pervaded all fields of biomedicine," it said. The technique is commonly described as gene "knockout". It enables scientists to silence specific genes, and monitor the effect, so that gene-by-gene they are able to build a picture of the development of disease. To date more than 10,000 mice genes - around half of the total - have been knocked out, with the rest confidently predicted to follow soon. As a result, more than 500 different mouse models of human disorders have been developed - including cardiovascular and neuro-degenerative diseases, diabetes and cancer. The technology spun out of the discovery by Sir Martin of embryonic stem cells in mice. These cells form all tissues of the body and Sir Martin found that they could be removed and grown separately in the laboratory. All three scientists, who will share the prestigious $1.54 million award, have subsequently used gene targeting to make significant advances. Professor Capecchi, based at the University of Utah, has used the technology to uncover the role of genes involved in organ development, and the overall plan of the body. 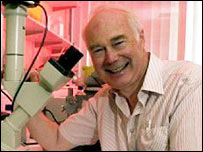 Sir Martin, of the University of Cardiff, has specialised on the inherited disease cystic fibrosis. He described the award as like winning the "World Cup". He said: "It's wonderful - the sort of thing which when you start off as a youngster in science you look up to these fantastic Nobel Prize winners, and think, could that ever be you? No, of course not. Professor Smithies, of the University of North Carolina at Chapel Hill, was born in the UK, but has since taken US citizenship. He has developed mouse models for common human diseases such as high blood pressure and thickened arteries. Professor Stephen O'Rahilly, of the University of Cambridge, said: "The development of gene targeting technology in the mouse has had a profound influence on medical research. "Thanks to this technology we have a much better understanding of the function of specific genes in pathways in the whole organism and a greater ability to predict whether drugs acting on those pathways are likely to have beneficial effects in disease." Jo Tanner, of Coalition for Medical Progress, said: "If we are ever going to find cures for genetic conditions such as muscular dystrophy and cystic fibrosis, scientists will need to work on animal models, identifying the genetic defects responsible and correcting them in animals before trialling potential treatments in humans. "This group's work has given hope to many thousands of people currently suffering from incurable genetic conditions."